Green house cleaning services in Cleveland area. The earth that we live in is now in danger. The ozone layer is depleting and is now slowly loosing its effectiveness to support all the life on earth. The ozone layer is being hurt by toxic chemical that we are using on a daily basis. There are studies that say, if you compare indoor air with outdoor air, in some cases, outdoor air may be safer than indoor air. This is because electronic appliances, decorations, fragrances and even cleaning products can cause harm to your health. You are most of the time indoor and are exposed to these toxic chemicals. While outdoor, the air flows and there are plants and trees that will help us breathe fresh air. Of course, there is a way to go green inside your home. This is the reason why Glossy Clean is offering its services for green house cleaning. If you are a busy working mother juggling between your job, your responsibilities to your kids and your husband, while managing your home, it is going to be difficult for you to take the time out to find chemical-free products and use them properly to clean your home and its environment. Thus, Glossy Clean can be your saving grace. It offers it services to you and your home. By securing the green home cleaning services from this company, you can be assured that you and your family will live in a healthy and clean environment. Of course, in combination with securing the services of green maid services to green clean your home, you have to compliment this by reducing the use of toxic chemicals such as fragrances and aerosols at home. Why are fragrances and aerosols harmful to the health? This is because fragrances and aerosols flow with the air at home, which puts asthmatic patients and children at risk. Even if you do not have an asthmatic person in your home, these fragrances and aerosols containing chemicals may cause skin and eye irritation. Usually, homes that use toxic chemicals in cleaning have more prevalence of sickness including headaches and skin irritations. Did you know why there are warnings in the label of your fragrances and your aerosols? This is because it can be dangerous to the eye. They also cause irritation to sensitive skin especially in children. For this reason, you will need to be careful with the products that you use. It is also helpful to allow fresh air to enter your home from time to time. Opening the window and allowing air to enter will have its benefits. Now, let us move on to the services that Glossy Clean offers. Glossy Clean offers to thoroughly clean your home and ensure that you will live in a healthy environment because our green maid services are trained for this. What does Glossy Clean use in its green house cleaning services? Here are some of them. Hopefully, you will understand how our green house cleaning services differ from our competitors. We do not use detergents containing petroleum or alkyphenol ethoxylates. If the need for cleaning is a bit intense, we will use vinegar, washing soda and liquid soap but we will not use chemicals in our detergents. Glossy Clean also uses tea tree oil in making sure that your house is clean and healthy as well. Because we will need to take out dusts and dirt in your home, we will ensure that you do not suffer from asthma or respiratory irritation by using Certified Asthma friendly vacuum cleaners. Our vacuum cleaners are certified as such by the Asthma and Allergy Foundation of America. They are specifically made for asthma sufferers and thus, as we clean your floors and your environment, our green cleaning services will not pose danger to you or your children. In ensuring that your sinks, tubs and countertops are safe for you and your family, we do not use chlorine bleaches. We usually use vinegar, baking soda and good liquid soap because they are effective and has no chemicals contents. Any residue from toxic chemicals touching your skin or your food may be harmful and thus we do not use them. Of course, there may be cases that we cannot complete the green house cleaning by merely using liquid soaps, baking or washing soda and vinegar. In some cases, we may need to use other cleaning materials but be assured that we only use earth friendly cleaning materials because we want to deliver a clean and healthy home to our neighbors around Cleveland. Our green house maids are mostly based on the area and thus we will only deliver as we promise because we want you to trust our work and keep us serving you and your family. 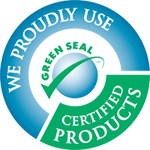 Our green cleaning company is a local and family-owned company and thus we deliver what we promise. We value our reputation and our customers can vouch for that. Now, aside from using all natural green cleaning materials, we want you to enjoy your sweet smelling home as well. Thus, we recommend that you use fragrant oils to freshen up your home. Because you want your surroundings smelling good, we recommend that you do not use fragrances and aerosol to freshen up the air, you should use natural fragrant oils such as rosemary, eucalyptus, sage or lavender. These fragrant oils will allow you to enjoy your home smelling good without risk of skin irritation and possibly asthma or respiratory irritation. Another way to freshen up the air would be to put baking soda in the open to absorb unwanted smell. You can do this by putting the baking soda in a decorative container and allowing it to absorb bad smell in your surroundings. Green cleaning your home can be a challenge, thus, Glossy Clean offers its services to make sure that you will live in a clean and healthy home.